Folks - one piece of advice: NEVER change your email address for X1 !! I changed it from Gmail to Outlook a year back or maybe longer. However, one way or the other the X1 server could not handle that. So I end up not being able to log in anymore. Sending mails to support (from Outlook). It was 'fixed', I could log in one, but but later I could not log in anymore. Not with my old, not with my 'new' email address. Using the "I forgot my password" button, to both email addresses, I don't get anything back. So creating a ticket isn't possible. A week or two I did a clean Windows 10 x64-install (1709 build 16299.192 being today's the latest version). I always expect X1 to crash, so, before installing X1 I always create an image of Windows. My experience is that X1 is the only program that crashes, therefore it is essential first create an image (e.g. using Reflect v7 free). Now, I don't expect users to know a solution. (though far-fetched...) come up with a sort of an idea. That is: anything else than to try an re-install. 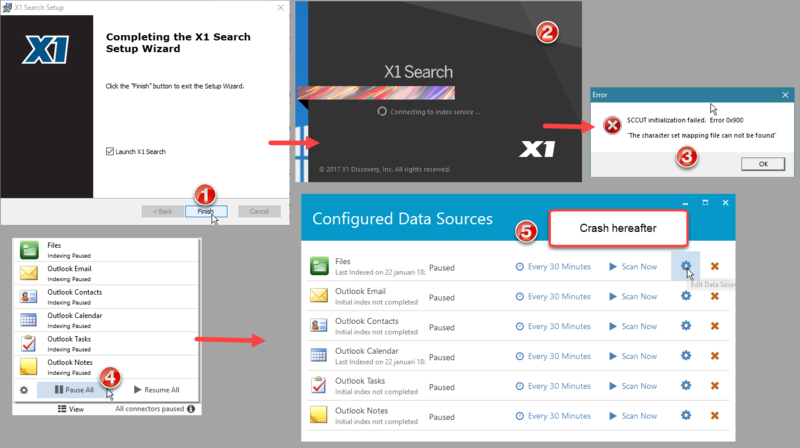 second, can you provide the logs from X1, so that we can try to determine what exactly caused it to crash. There are no log files, I have restored the image that I created just before installing X1. What does the below error in the eventlog mean?